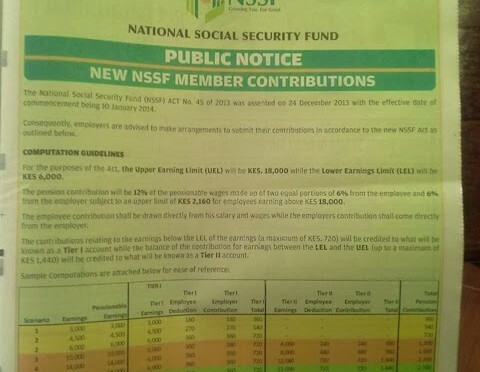 This weekend, the National Social Security Fund ran an advertisement in the newspapers clarifying amounts that employers and employees will pay now that changes to the NSSF act are legal. From a note at Alexander Forbes Financial Services: The effective date (of the NSSF Act) was 10 January 2014, literally giving employers no time to apply for the opt out. 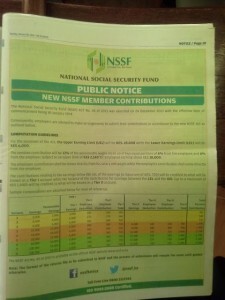 They thus will have to remit both Tier 1 and Tier 2 contributions to NSSF until the opt out is granted…also that these amounts will increase each year for the next 5 years. EDIT – Jan 21: The Government has deferred the commencement of the new NSSF Act to the end of May 2014. This means that the contributions to the fund will be made at the old rate. Read more. This entry was posted in Kenya parliament, KRA, NSSF Kenya, pension schemes, retirement, SME solutions on January 20, 2014 by bankelele.